Spray large nonstick skillet with cooking spray. Add tortilla pieces and chicken; mix well. Cook over medium-high heat 5 minutes or until hot, stirring frequently. 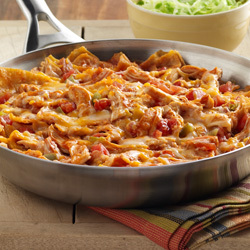 Combine undrained tomatoes, enchilada sauce and tomato sauce in medium bowl; pour over chicken mixture in skillet. Mix well. Sprinkle 1/2 cup cheese over chicken mixture. Cover skillet; cook 5 minutes or until hot, stirring occasionally. Sprinkle with remaining 1/2 cup cheese. Serve immediately.